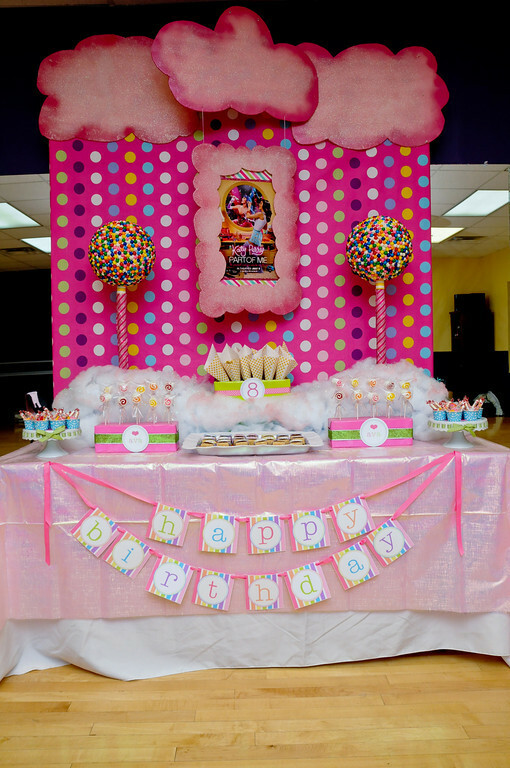 Since our daughter loves dancing, especially to her favorite Katy Perry music, it was only fitting she requested a Katy Perry birthday party for her 8th birthday. 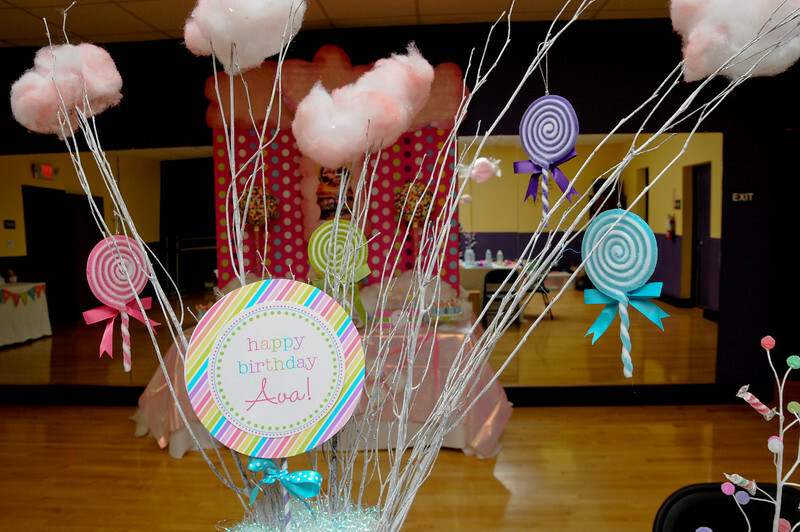 When she first mentioned this, I knew right away we could have it at her dance studio, but pondered how I could bring in Katy Perry elements and also make it age appropriate for her and her friends. 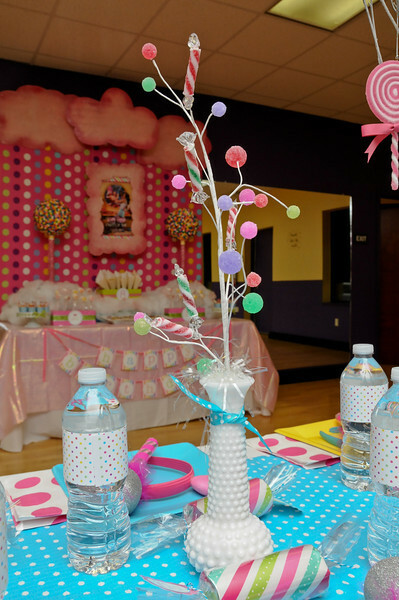 After watching some of Katy Perry’s music videos and DVD for muse, I decided to bring in candy land components and her signature fun headbands. 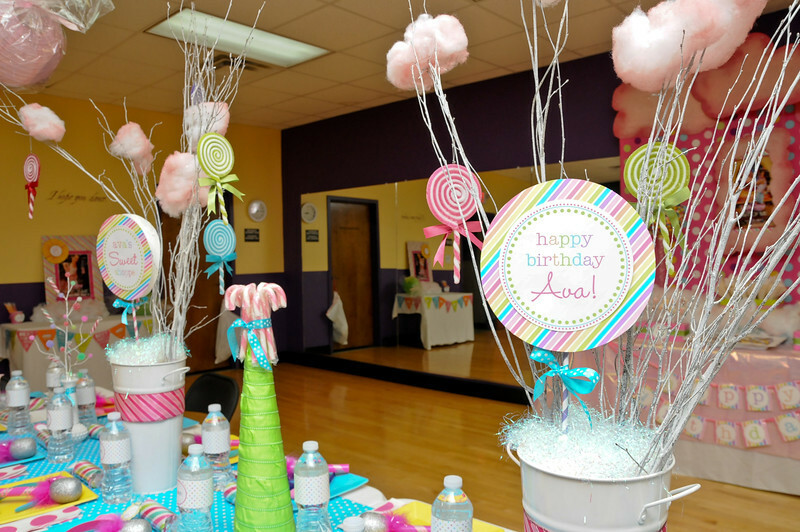 I find that guests really enjoy having props to wear that help them feel more like the character of whatever the theme of the party is. 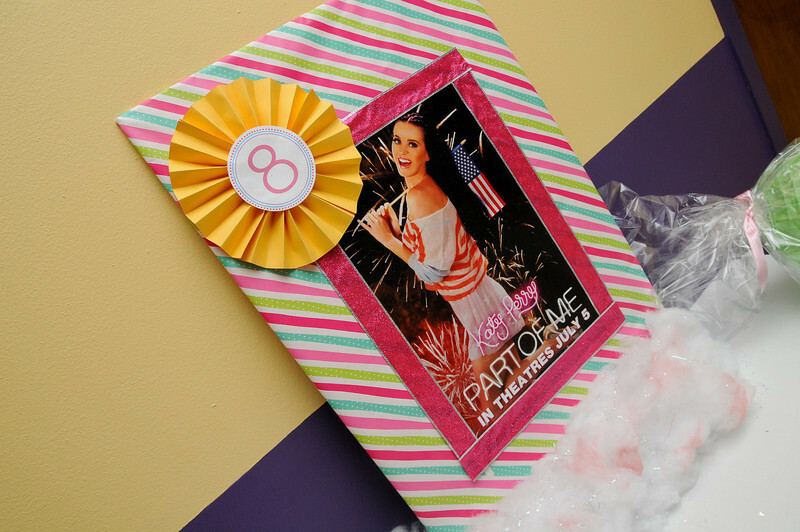 So, I found foam pink fuzzy hearts and colorful headbands at the Dollar Tree and hot glued them together to create her look from one of her videos. 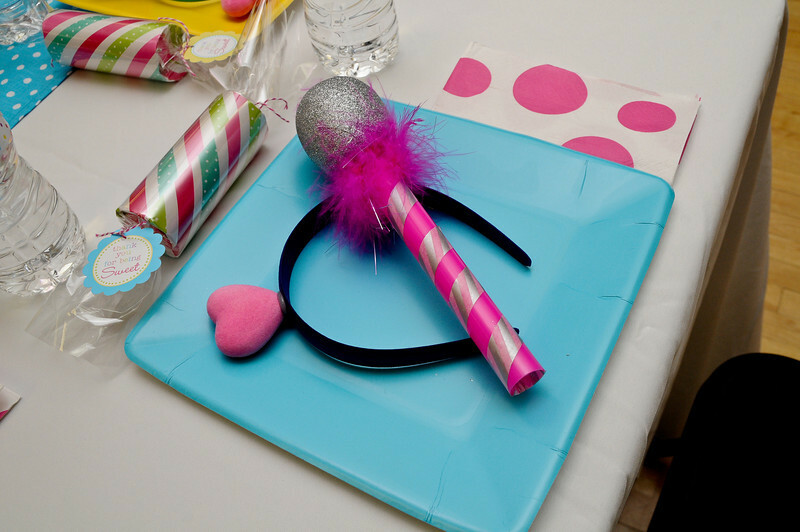 I also found hot pink microphones that I wrapped with craft tape to create the candy cane stripe effect. 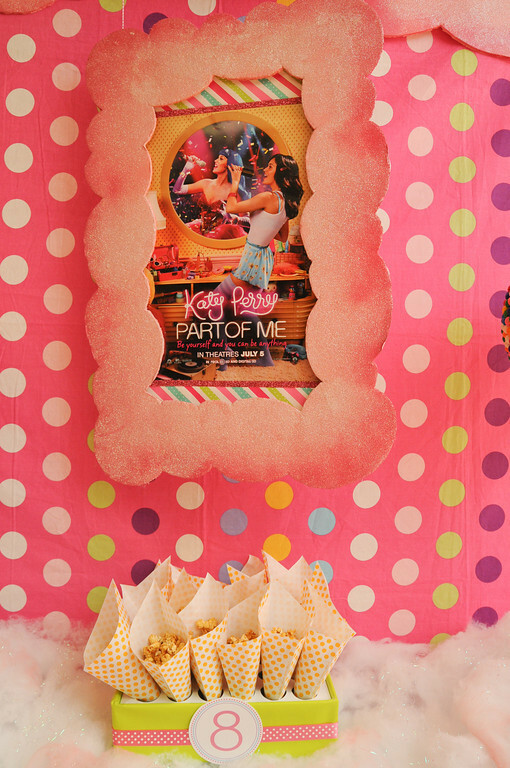 My daughter’s one request was that she really wanted to use Katy Perry’s movie poster on the main dessert table, so I decided to create a “pink cotton candy cloud” frame for it using $1 foam board, pink spray paint and lots of white sparkly glitter. 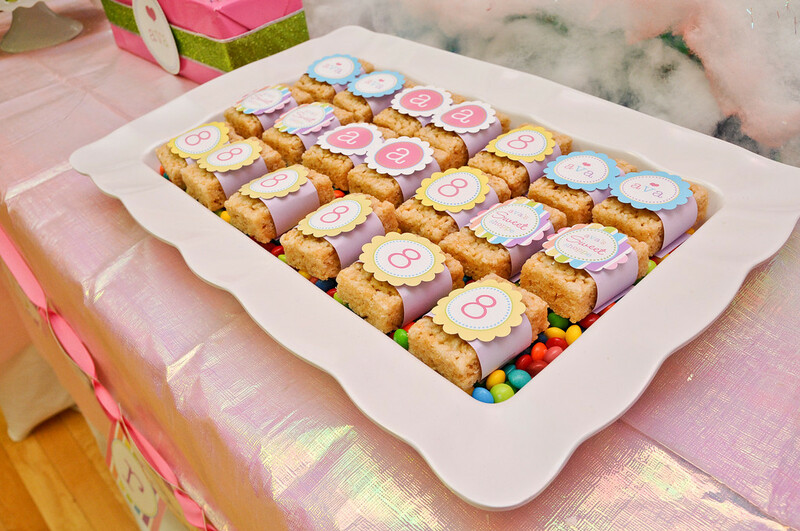 Being that my daughter and many of the guests have so many food allergies, all the desserts needed to be nut free, egg free, dairy free, and gluten-free. 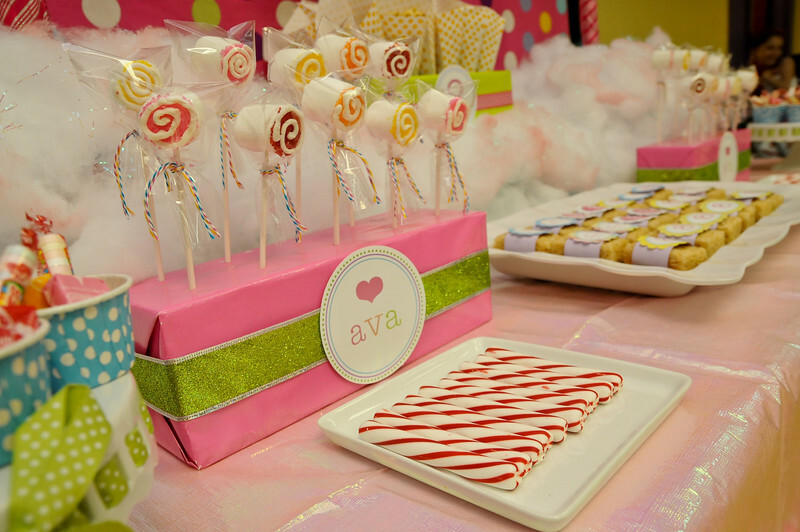 So I served rice treats wrapped with beautiful printables created by Kim Stoegbauer at The TomKat Studio, and I made marshmallow “swirl pops” on sticks. 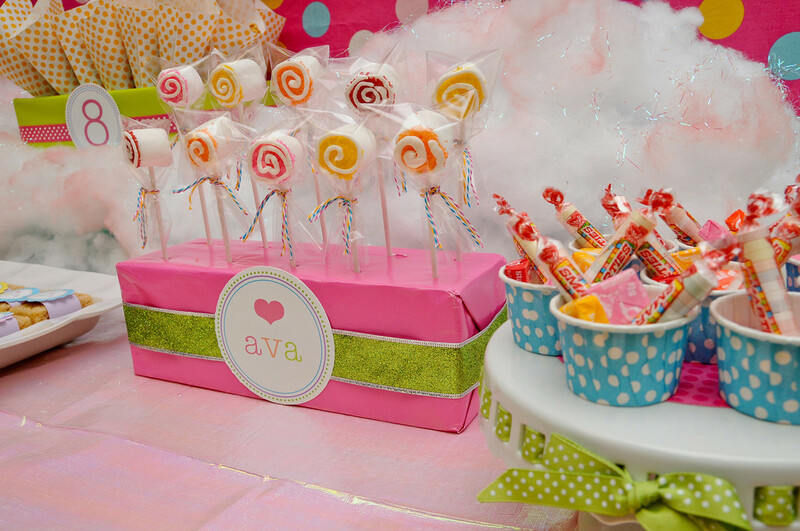 We also had popcorn in paper cones and filled treat cups with “safe” candy as well. 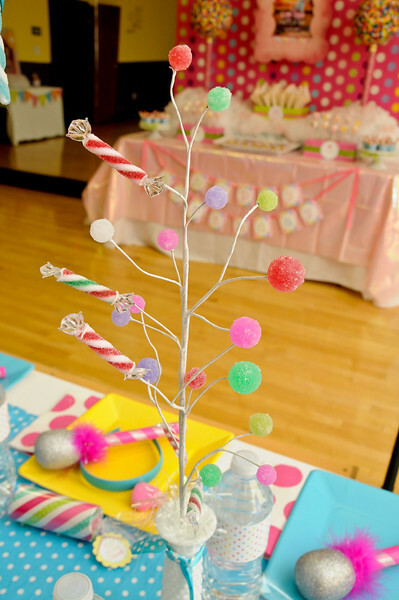 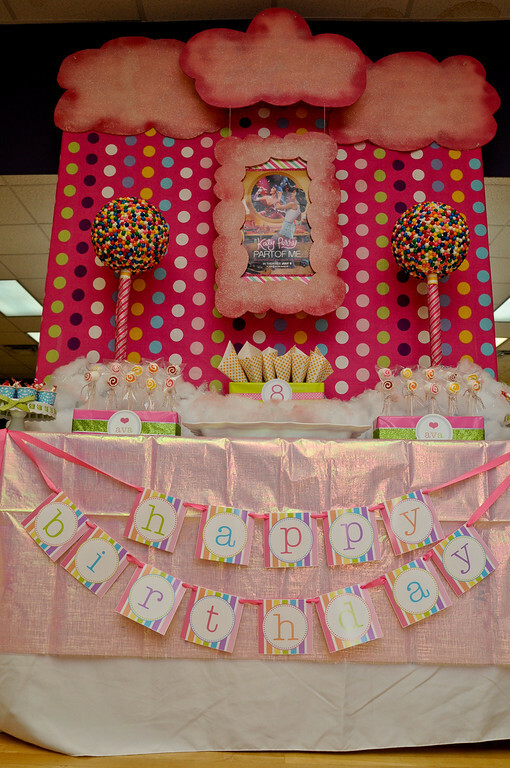 The centerpieces on the children’s table were made using white branches, lollipop ornaments, and Kim’s large lollipop customizable printables. 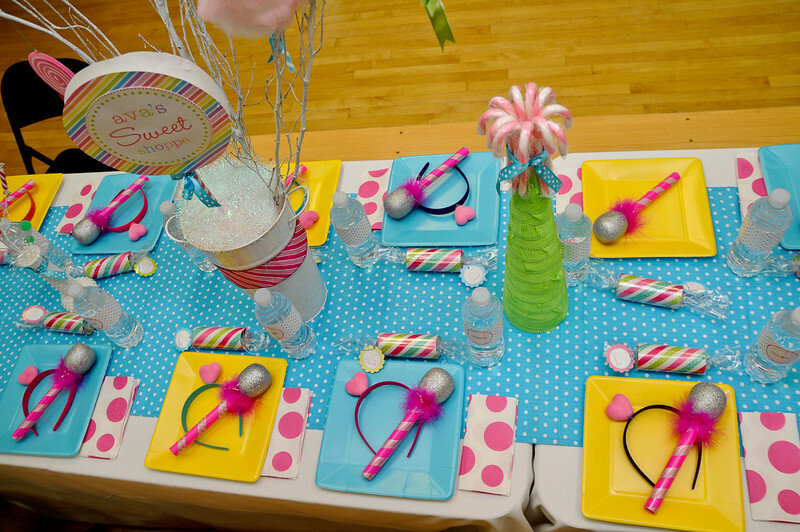 At each place setting were the child’s favors … the headband, microphone, and fake candy wrapped containers filled with gum balls. 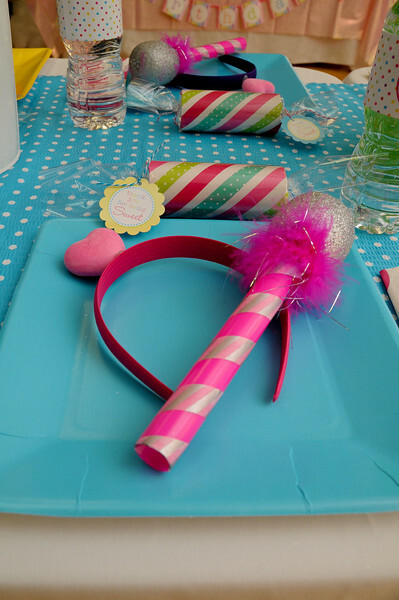 They also had a bottle of water wrapped in a free printable designed by Kori Clark of Paper & Pigtails. 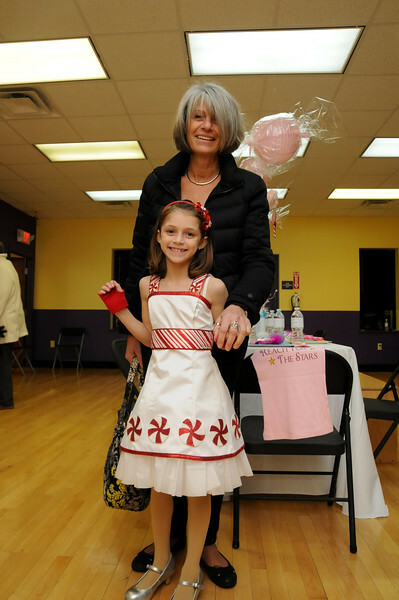 Everyone had such a lovely time dancing away to Katy’s music, and Ava looked adorable in a custom dress my mother-in-law made for her to replicate the one that Katy wears on her concert tour! 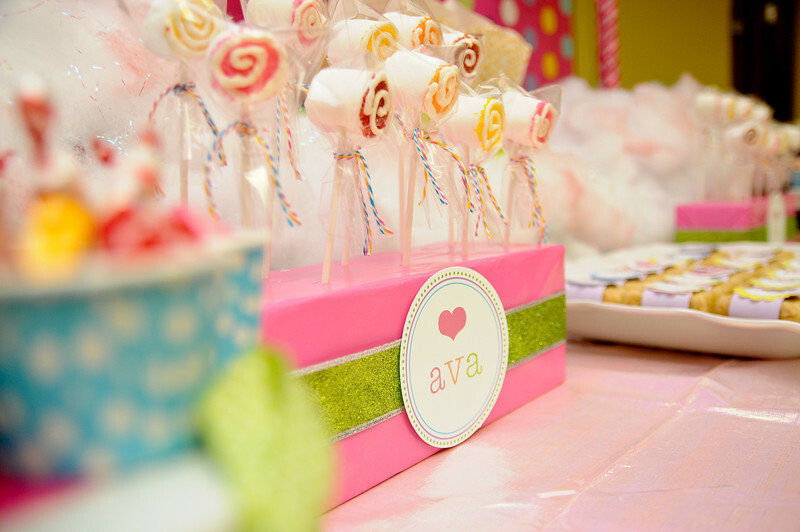 The lovely pictures were taken by Veronica at Veronica Huang Photography and I was thrilled Hostess with the Mostess selected the party as one of their Party of 5!